A Marvel hero last seen in Daredevil: Season 2, urban vigilante Frank Castle AKA The Punisher (Jon Bernthal) returns to Netflix with his own show. Frank Castle of Daredevil 2 was an ex-Marine who was shot and left for dead. Miraculously recovered, with the assistance of Karen Page (Debra Ann Woll) and a CD from “Micro,” he sets out to avenge the murders of his family Maria (Kelli Barrett), Frank Jr. (Aidan Pierce Brennan), and Lisa (Nicolette Pierini). We become reacquainted with Castle (now posing as construction worker Pete Castiglione) at a support group for troubled military veterans run by disabled vet Curtis Hoyle (Jason R. Moore). Homeland Security senior agent Dinah Madani (Amber Rose Revah) works in New York for bureau chief Carson Wolf (C. Thomas Howell). She and partner Sam Stein (Michael Nathanson) investigate the death of her Afghan contact Ahmad Zubair (Shez Sardar). After uncovering a heroin ring operated by US military forces, Zubair was tortured and murdered by “Cerberus,” an illegal killing squad, that included Billy Russo (Ben Barnes) and best friend Castle. Russo, now a successful military contractor, is heavily involved in the Afghan narcotics trade along with Colonel Morty Bennett (Andrew Polk), former black ops strategist and now CIA senior operative Bill “Agent Orange” Rawlins (Paul Schultze), and Wolf. “Micro,” former NSA analyst David Lieberman (Ebon Moss-Bachrach), was supposedly killed by Wolf. He is now hiding in an abandoned power station and keeps his wife Sarah (Jaime Ray Newman), and children Zach (Kobi Frumer), and Leo (Ripley Sobo) under 24/7 covert surveillance. Lieberman possesses a secret video of the Zubair assassination that incriminates Schultz and other high-ranking government officials. Castle takes out Wolf after he uncovers the bureau chief’s role in his family’s murder, and then forms an unlikely alliance with Lieberman. Frank also reconnects with reporter Karen Page to help him with his quest for justice. After agents Madani and Stein unwittingly get drawn into the massive drug trafficking ring with tragic consequences, Chief Rafael Hernandez (Tony Plana), Madani’s mentor, questions her fitness for the agency. Her proactive behavior catches the attention of CIA director Marion James (Mary Elizabeth Mastrantonio) who has a long-standing connection to Rawlins, not realizing that he is a vicious drug trafficker. Rawlins and Russo plot to eliminate Castle, Madani, and Colonel Bennett (the weak link in their narcotics business) and get rid of the Zubair video. Subplots abound, including the budding relationship between Frank and Karen, the literally steamy affair between Russo and Madani, and the unbridled violence of unhinged Afghan vet, Lewis Walcott (Daniel Webber). As the body count rises with numerous paramilitary contractors biting the dust,The Punisher moves inexorably toward the final showdown between former best friends and now mortal enemies, Castle and Russo. Steve Lightfoot has crafted a complex storyline and populated it with characters that are deeper and more interesting than most of the casts of previous Marvel shows. Castle lacks the super powers of Luke Cage, Daredevil or Iron Fist but has been endowed with incredible survival instincts and recuperative powers. In fact, I do not recall seeing any hero receive so much corporal punishment and serious wounds, and yet somehow live to fight another day. The Punisher becomes the “everyman” hero that, in spite of his brutal “god of war” persona, convinces us that he can save our dangerous world from itself. The remaining cast is exemplary: you get to boo the villains portrayed by Barnes and Schultze and root for the good guys, Moss-Bachrach, Revah, and Hoyle. 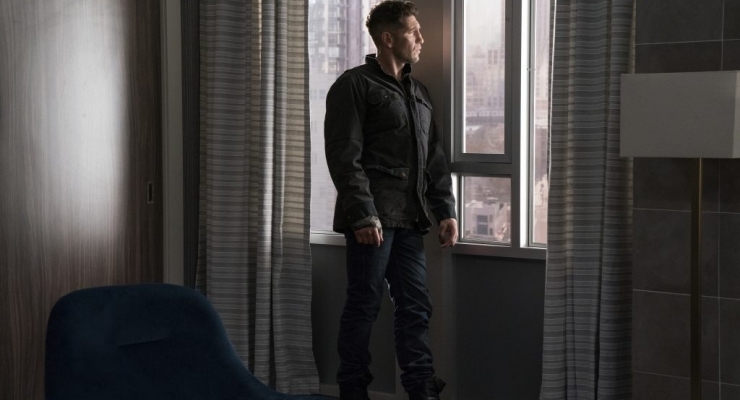 The Punisher is by far the most graphically violent of all the Marvel series aired to date and even the flashbacks to Castle’s happier times with his late family cannot dispel the thirteen episodes’ overwhelming darkness. Substituting visceral excitement for thought-provoking dialogue, this is another “show” rather than “tell” series. There is already some buzz about a Punisher Season 2 and, with no shortage of wrongs to be righted in the Big Apple, I hope this comes to pass. 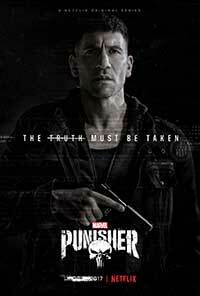 Marine veteran Frank Castle (Jon Bernthal) becomes a nearly unstoppable vigilante hunting down the people who murdered his family in this dark thrill-packed Marvel series with a death-defying hero who survives endless threats making this one of the best Netflix Original efforts to date.